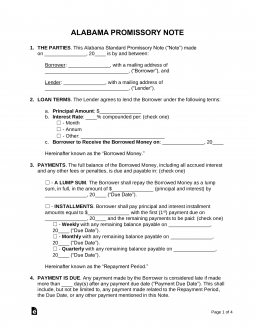 The Alabama promissory note templates are documents that verify that a loan was given to an individual for the purpose of repayment over a period of time. The time period and interest rate are to be negotiated by the parties along with any security to be provided (if any) by the borrower. Usury Rate – The maximum interest rate that can be charged is six-percent (6%) if the Note is longer than 1-year and 8% if greater. Minimum amount is $100 to qualify. Secured Promissory Note – Allows the lender to hold something of value if the borrower does not pay back the amount loaned. Unsecured Promissory Note – Usually for family, friends, or those with a high level of credit. There is no property that is guaranteed if the note becomes in default.